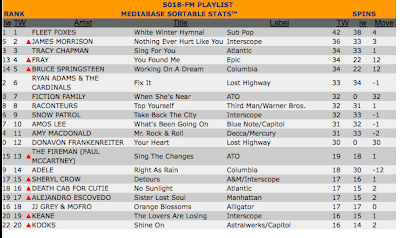 Sirius Satellite Radio (AAA Rock format) is the first officially recorded radio station to spin Fiction Family's debut single, "When She's Near," coming in at No. 7 on that stations playlist! Woot! it looks like they're giving "When She's Near" a lot of spins. 32 plays within one week isn't too shabby at all! This is interesting, as it is an advance add, about a week before the song officially impacts to Triple A radio. PLUS: Tons and tons of Fiction Family Press! Jon Foreman Song To Be Featured on "One Tree Hill"
The WB’s ONE TREE HILL will use Jon Foreman's "Behind the Eyes" in the Jan. 12th episode. Check out http://www.thewb.com/shows/one-tree-hill/ for more details on the show. This should be awesome. Jon's songs have been in other popular tv shows. Remember "The Cure For Pain" showing up on Grey's Anatomy last year? What's after that you ask? well, I'll tell you: I'm setting out with a merry band of men called Fiction Family to traverse this democracy with songs of good cheer! peace in the mideast, literally and figuratively, my brothers. Fiction Family covers a Radiohead song! More Press and new Fiction Family Myspace pic! Fiction Family Launches new Tour Blog!